Like The Mighty Mighty Bostones in their song, “I'm always amazed by what can take place within the space of 300-365”. Where did 2012 go? And what did I do this past year anyway? It is true; time DOES fly so much faster with age. (Current age to be withheld for fear of “over the hill” jokes.) This past year has been filled with so much activity it actually becomes hard to remember all of it. That is why I decided I am going to follow the trend that is out there and start my first 365 Day Photography Project. You may have seen or heard of this online somewhere. Many photographers choose to do this 365 day project when they need some inspiration. Moms want to participate in this project to capture the lives of their children. It consists of taking one photo a day, for 365 days, and all of them need to be different. Some choose to select a subject matter, like landscapes or portraits. Some choose to select themes, like children or buildings. But most do an all-around 365 different photos of everything, which is what I will be doing. Taking a photo every day will make me a better photographer. Using my camera will help me become more knowledgeable about lighting, composition, and the functionality of my camera. 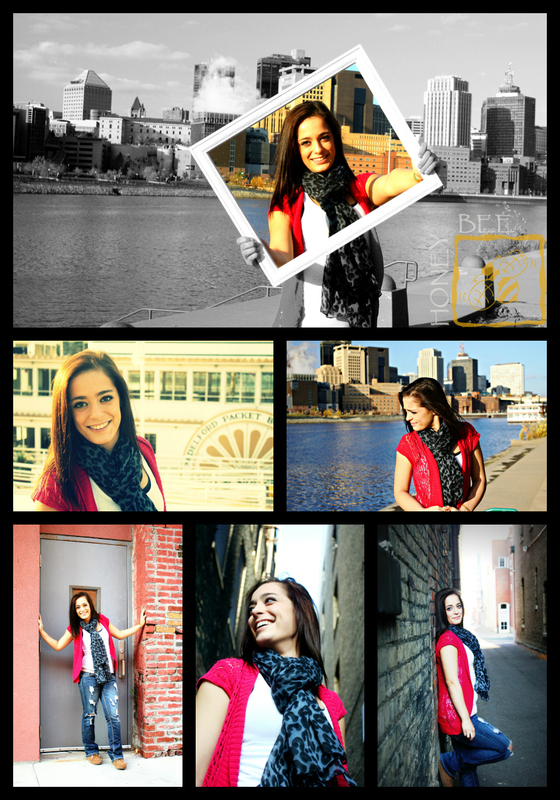 Because I will be “forced” to take a new photo every day it will help me become more creative with my photography. My memory is not what it used to be. It will be wonderful to look back at every day throughout the year and remember what I did, who I was with, what I experienced and what I learned. Changes can happen in an instant. Capturing daily life throughout the year will help document all the changes over the year. My husband and I were married this year and I would love to document the next stages in our lives….whatever that may bring! After doing a little research on this project, I thought I better put together a plan! So, here are some thought I had that will help me along with way. Always have my camera with me! This is nothing I will need to work on, because I always have my point-and-shoot camera in my purse. I don’t plan to carry my “good” camera all the time, so some of my photos will be taken with my point-and-shoot and possibly with my Android. Figure out what I want to get better at! Because I want to improve my craft, I plan to find photos that I love and try to recreate them, while learning along the way. Try new things. Throughout the year, I plan to use different settings, lighting techniques and different angles. Read photography blogs. There are so many terrific blogs, websites and books out there. So many photographers love to share the knowledge they have gained over the years. Take Notes. I think I may keep a photography journal, or better yet, keep a photography calendar that keeps track of the shots I took, what worked and what didn’t. Stay motivated! By blogging on my website about this project and posting my photos on Facebook, I hope you all will help me stay motivated! Yes, husband, this means I need your help too! So, it begins tomorrow on January 1st, 2013! Will you please help me? Send me ideas! Send me motivational messages! Send me reminders! Wish me luck! Twist off another and bring on next year. 365 DAYS! For some of us, winter is a time that we may avoid. We may just sit inside by a warm fire, dreaming of a hot summer. Not these two gals. 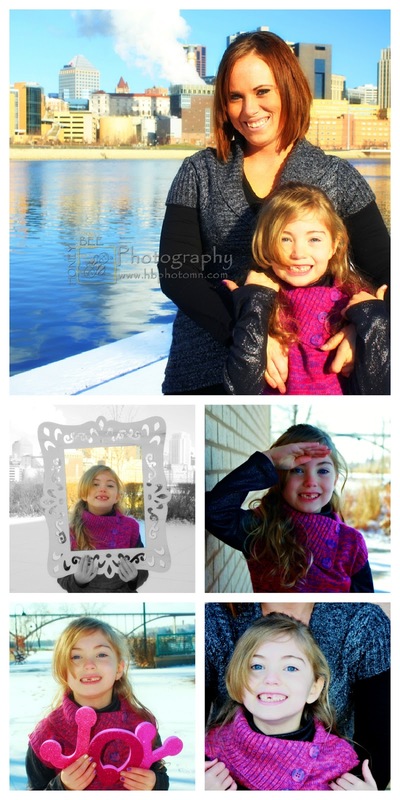 Robyn and her daughter, Hailey, took advantage of the shining sun on this cold, cold winter day. And to my surprise, Hailey lost her first tooth right before the photo session. We had fun, spite the cold and goofed around quite a bit. Can you guess which one of them was on the naughty list? 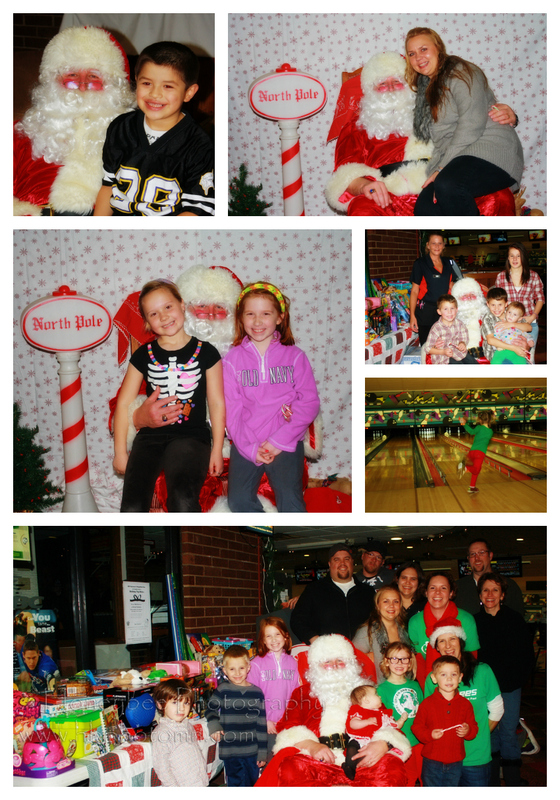 Thank you to everyone who showed up for the Holiday Toy Drive and Santa Claus Visit on December 9th hosted by the South St. Paul Jaycees. Even though the Twin Cities received almost a foot of snow, there was a great turnout and they were able to donate a ton of gifts to Neighbors, Inc. for the holidays. 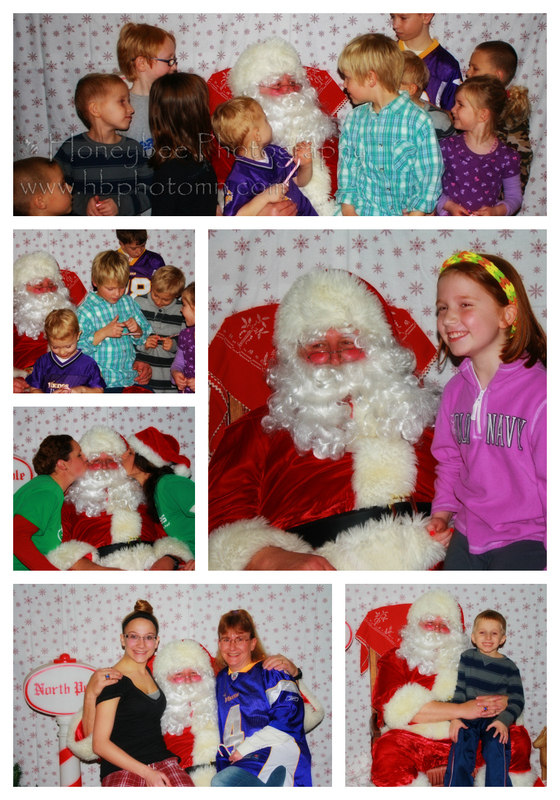 During the event, Honeybee took photos of the children with Santa Claus. 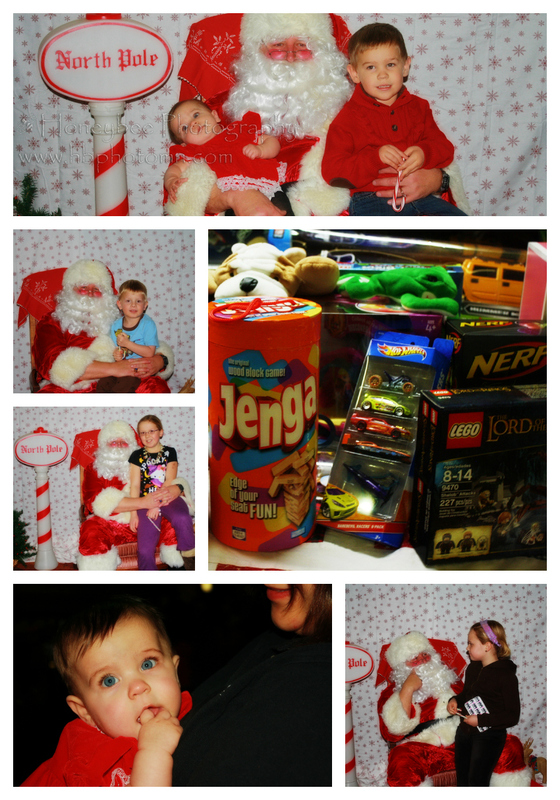 I don’t know what I enjoyed more, seeing how many gifts that were donated or watching the faces of the children sitting on Santa’s lap while they described all the items on their Christmas list. 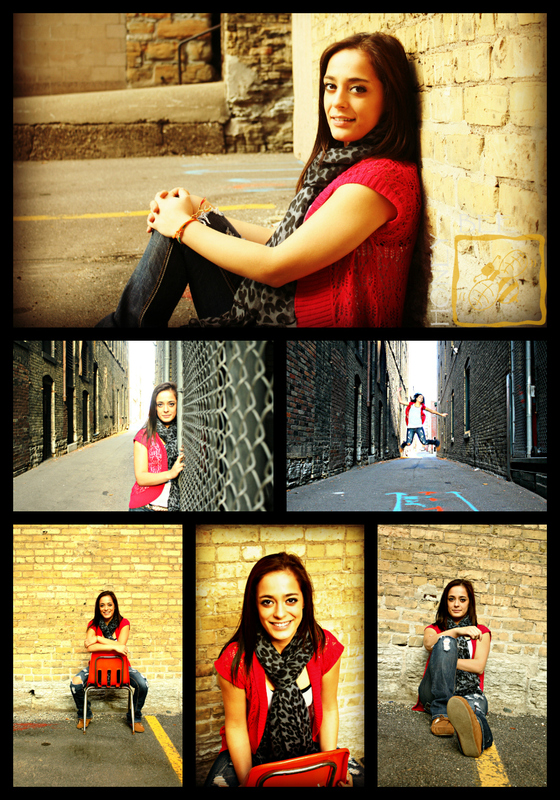 For those of you who received their free photo via email, I hope you enjoyed them. 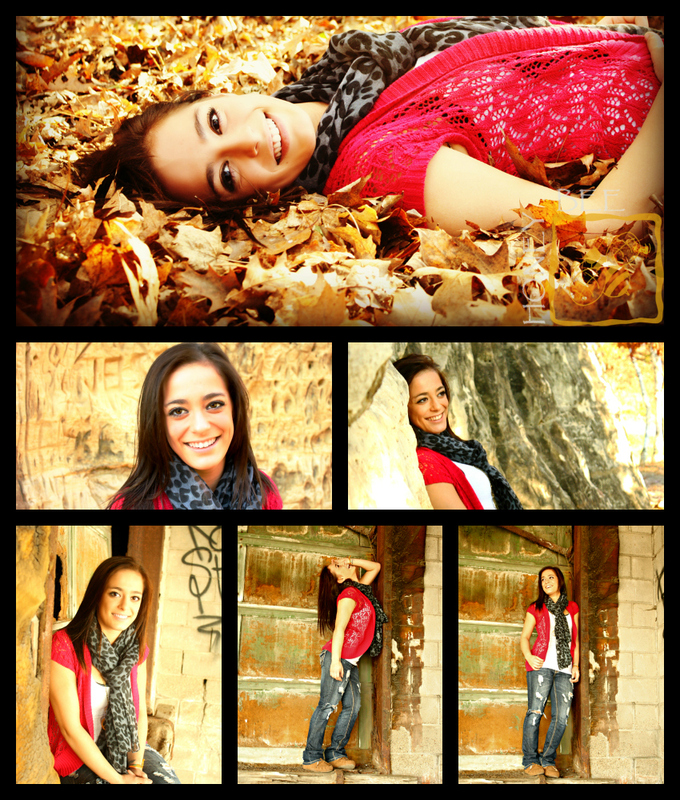 Here are samples of what you may see in your package. Thank you again to everyone who showed up to the event. Please enjoy the event photos. 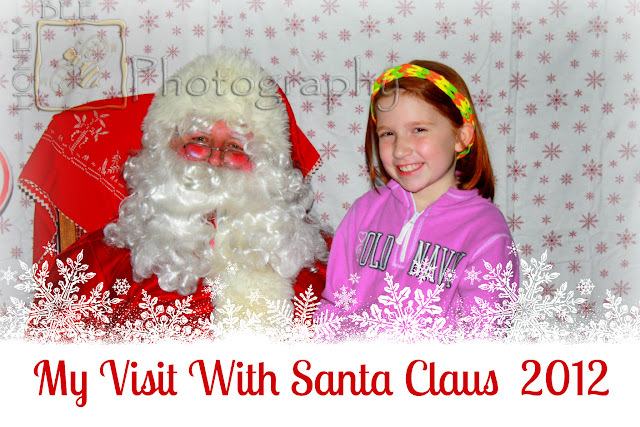 Santa Claus is coming to South St. Paul! That’s right, you heard me loud and clear! 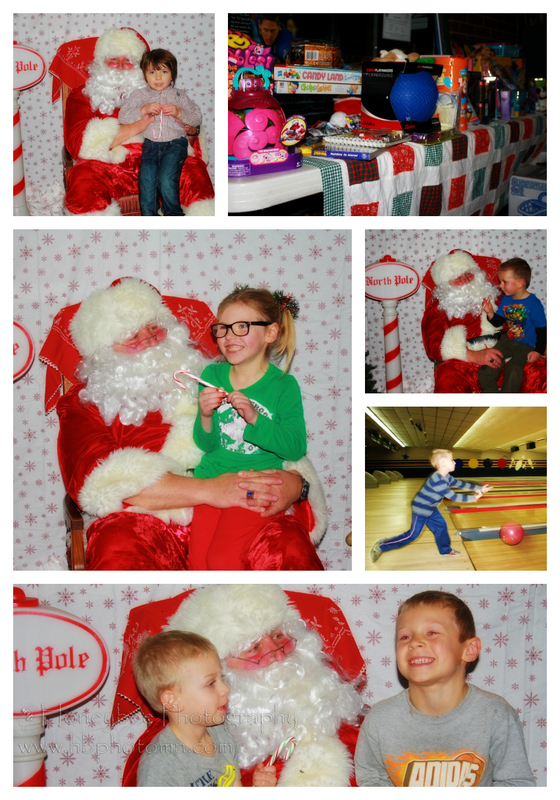 Santa will be making an appearance at a Holiday Toy Drive being hosted by the South St. Paul Jaycees and Neighbors, Inc. Honeybee has volunteered our time to photograph this event and take your photos with Santa! 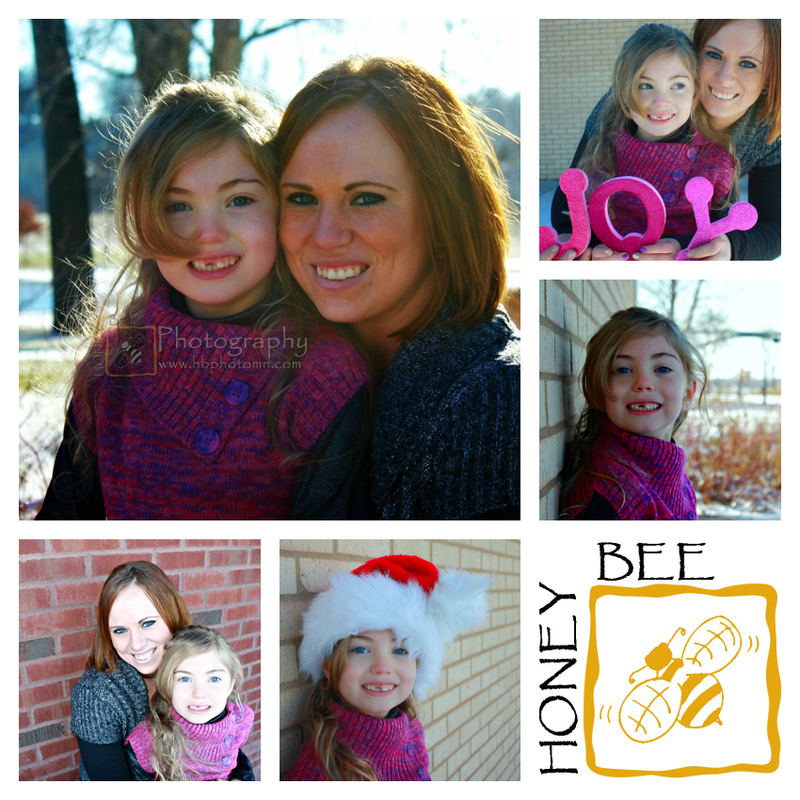 Honeybee will be photographing your child or family with Santa. You will receive one free professional unedited photo (with the Honeybee logo) following the event. If you are like me this year has flown by! The same can be said for the holiday season! 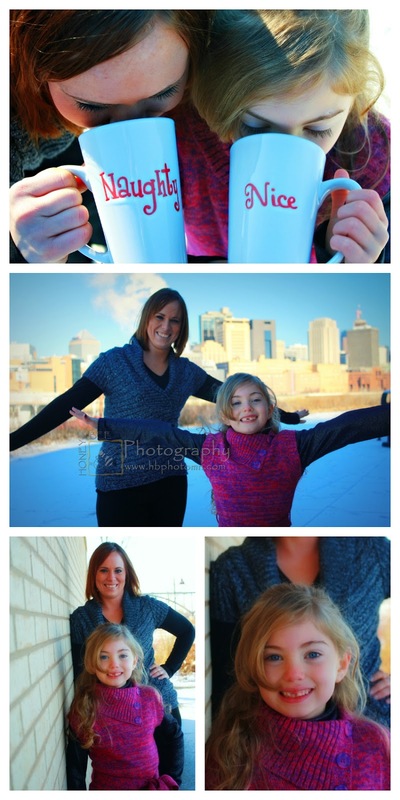 It is not too late to get beautiful family photos just in time for Christmas! 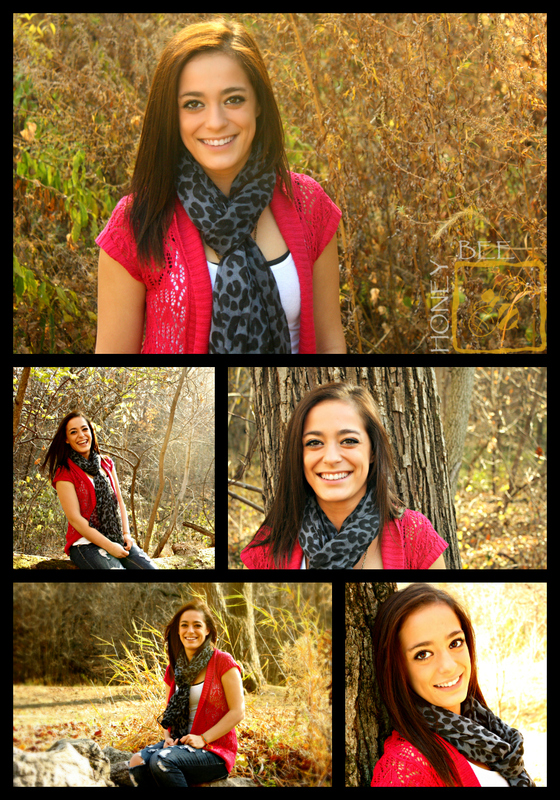 Perfect for holiday cards or just updating your family photo! Limited spots available – call to reserve yours! 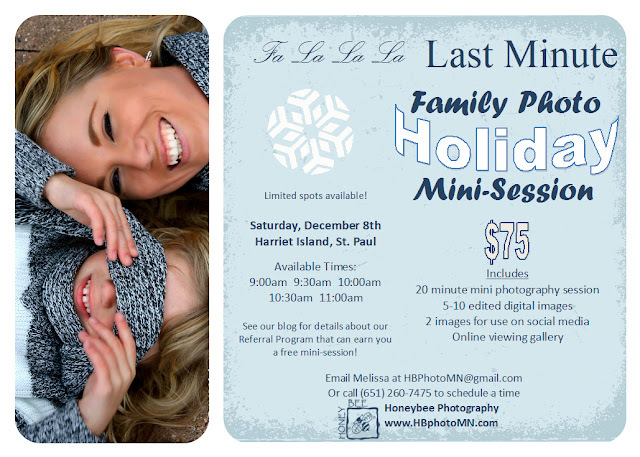 The mini-sessions are being held on Saturday, December 8th at Harriet Island from 9:00am – 11:30am. 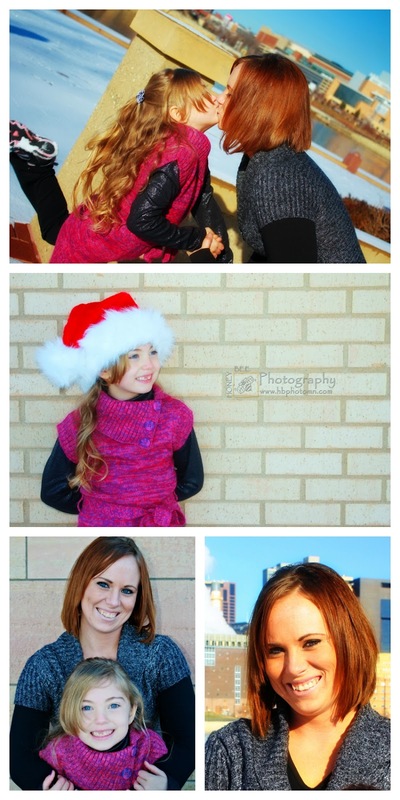 There are only 5 time slots available for this 20 minute immediate family or children mini photo session. In order to make sure you get your photos in time for Christmas, your images will be initially available online, with a CD to follow. Email Melissa at HBPhotoMN@gmail.com or call (651) 260-7475 to schedule a time. 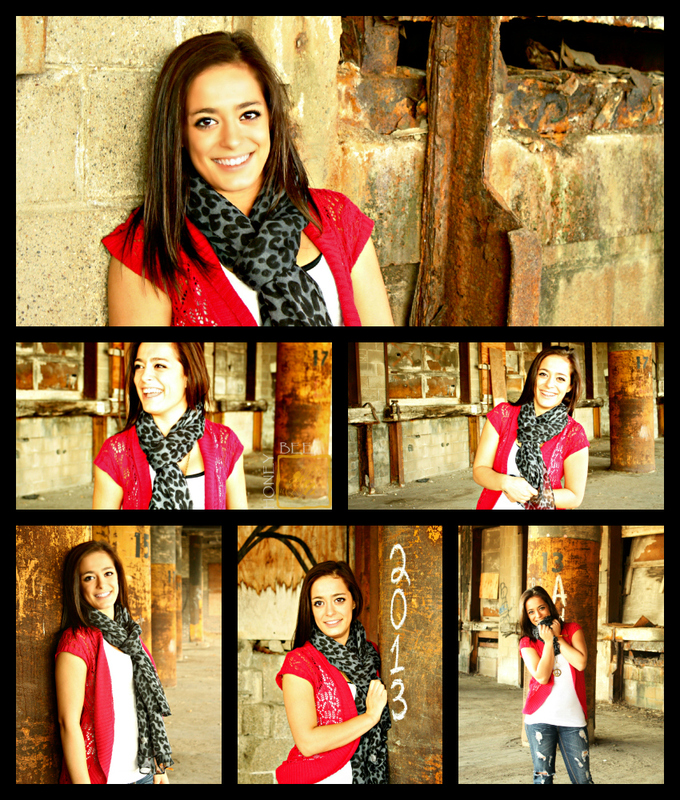 The mini-session can include up to 4 people. Each additional person will be an added $10/person. 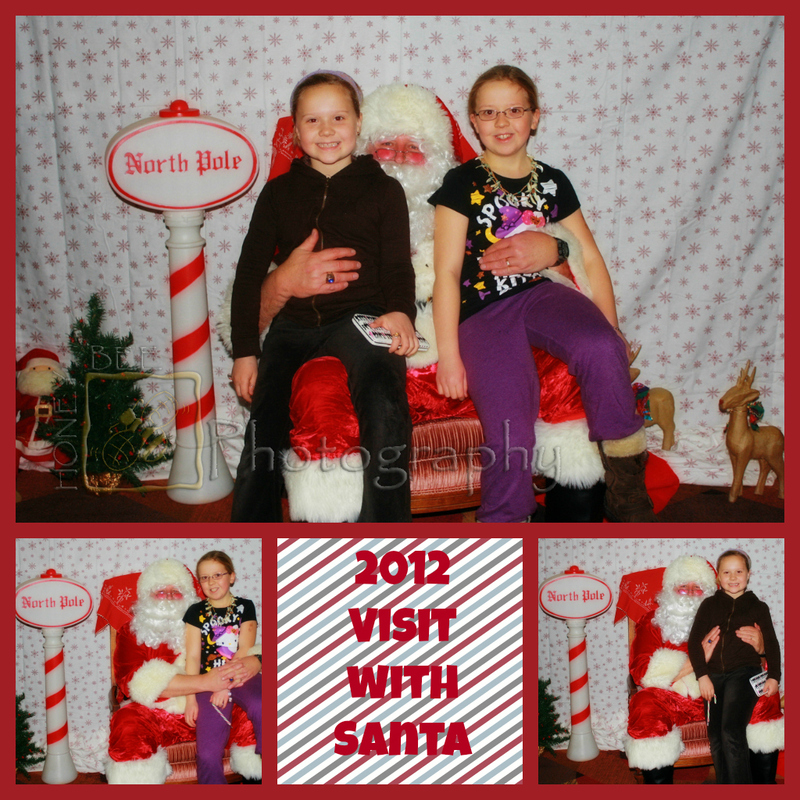 Because of the limited amount of time, the mini-sessions are not available for seniors, newborns or large groups. Each friend you refer that books this mini-session (or a personal session) and “likes” our Facebook page will receive 20% off your mini-session, which means if you refer 5 people, your session is free. In order to receive the referral credit they must inform Honeybee at the time of booking that they were referred by you. Only new clients will be considered a ‘referral’.